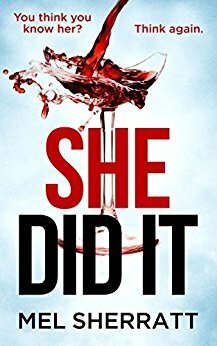 Today I'm featuring an upcoming read, She Did It by Mel Sherratt. The excerpt comes from the Kindle version, purchased from amazon.com. I hardly dare open my eyes but I must. I don't even know how long I've been here. An hour, perhaps? Two hours? A minute? Why is my watch broken? I'm sitting on the floor, my back against the wall. My knees pulled to my chest, my hands wrapped around them. The kitchen tiles are cold on my feet. A metallic smell is in the air. The narrator's opening questions and the metallic smell in the air don't bode well. It has me curious, and I'm looking forward to finding out what's going on.